If a patient has primary and secondary insurance plans attached to his or her record, after a primary claim has been paid, a secondary claim is created automatically. However, if you add a secondary insurance plan to the patient's record after a primary claim has been paid, you must manually create the secondary claim. Note: This is also true for a tertiary plan that is attached to a patient's record after a secondary claim has been paid. On a patient's Insurance Claims page, select a primary (or secondary) claim that has a status of Payment Received. 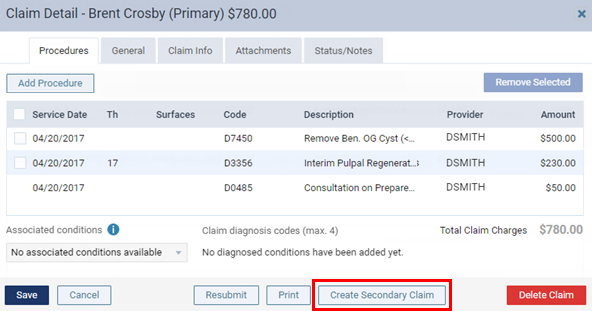 Click (or tap) Create Secondary Claim (or Create Tertiary Claim). Review and submit the secondary (or tertiary) claim. THERE SHOULD BE AN OPTION LIKE THIS TO SUB SECONDARY PRE AUTHS ALSO! !